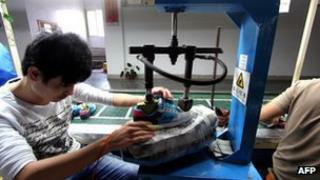 Manufacturing activity in China grew at its fastest pace in two years in January, according to data from HSBC. The preliminary reading of the Purchasing Managers Index (PMI) was 51.9, compared with 51.5 in December. Levels above 50 indicate expansion. China's leaders have taken steps to boost the country's growth, of which manufacturing is a major component. The data is the latest sign that the world's second-largest economy is recovering after a sharp slowdown. "Despite the still tepid external demand, the domestic-driven restocking process is likely to add steam to China's ongoing recovery in the coming months," said Qu Hongbin, chief China economist at HSBC. The HSBC preliminary reading, called Flash PMI, is a private survey of more than 420 companies. The responses of 85%-90% of the companies form the reading. The pace was the highest since January 2011 and above 50 which indicates an expansion. The last official PMI reading, the government's gauge, came in at 50.6 for December, a third month of expansion. The manufacturing sector, a driver of China's blistering growth in previous years, has been facing headwinds. Export demand has sagged as Europe and the US suffer debt crises. HSBC's final PMI in December had showed export orders falling, at odds with government data which pointed to a recovery in shipments. However, Thursday's HSBC data showed exports had stabilised in January, with the export orders sub-index rising to 50.1 - indicating fractional expansion - up from 49.2 in December. The apparent bottoming-out in exports, as well as government spending on investment and infrastructure, have helped China's economy recover from its worst slowdown since the 2009 global recession. Economic growth was 7.9% between October and December, compared to the previous year. But the pick-up near the end of the year could not prevent China from posting its slowest annual expansion in 13 years for 2012 as a whole, growing at 7.8%.